On April 22, 2018 Consulate General organized а Consular Day in Los Angeles. On that occasion Acting Consul General Dejan Radulovic visited the church-school parish of St. Sava in San Gabriel, suburb of Los Angeles. He attended the liturgy of the morning and then met representatives of the church-school parish who introduced him to the work and activities of the Serbian community. Acting Consul General had meetings and spoke with the citizens of the Republic of Serbia on matters of consular services. On this occasion, all citizens, who have previously contacted the Consulate General, were allowed to sign and authenticate the documents in a legally prescribed form. 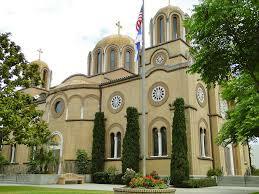 Acting Consul General visited the Orthodox church in Arcadia, suburb of Los Angeles, where a Serbian festival was held on that same day. On that occasion he addressed the attendees and informed them about the responsibilities of the Consulate General, as well as informed them about the opening of the Consulate of the Republic of Serbia in Los Angeles headed by Honorary Consul Dr. Ryan Osborne. He also responded to interested parties to their questions on consular services. Consulate General is grateful to St. Sava's Church and School in San Gabriel for their assistance and support in organizing the visit and the Consular Day.